There is a difference between kitchen gadgets and kitchen tools. Gadgets are typically used only once and they often end up being too hard to use, clean or store; not worth the trouble. A kitchen tool, on the other hand, is something that is used frequently, saves time and helps produce a better end result. That's why I put lettuce spinners in the tool category. If you like to create your own greens for a salad, a spinner is truly indispensable. 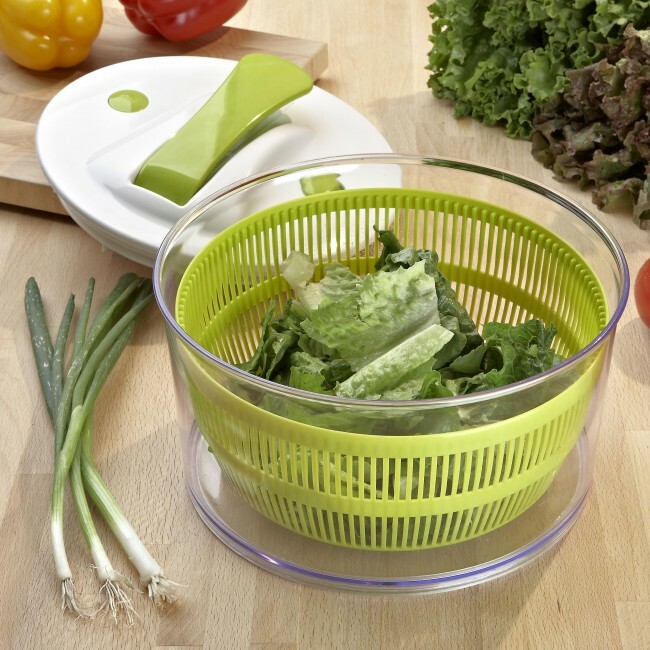 The spinner is designed to work with leaf lettuces and other leafy greens. The leaf lettuces are cut off at the bottom, rinsed thoroughly and then individual leaves are set inside the spinner. It was not intended for use with iceberg lettuce. The cord is pulled and causes the inner basket to spin removing any water that would otherwise accumulate on the leaves. The water is poured out of the spinner and the spinning is repeated one or two more times depending on how many leaves you have in the spinning tub. So why is this important? If wet leaves are used to create a salad, it's hard to get a dressing to take hold of the pieces because the water wants to run off the leaves and pool to the bottom of the plate creating a watery mess of the dressing. If the leaves are spun dry, then the dressing sticks to the pieces and flavors the greens as it is designed to do. I'm also a fan of the spinner because it acts as a the storage container for the lettuce. So after coming home from the store I immediately cut off the bottom of the greens, give the leaves a good rinse and toss them in the spinner and spin. As they sit in the spinner they crispen and will keep for several days, even a week or two if they are super fresh heads to begin with. You can store other greens simultaneously as well. When you are in the mood for a salad, the leaves are crisp and ready to use. Now that's a cool tool.